The 517th Parachute Infantry Regiment, was initially formed in March, 1943 at Camp Toccoa, Ga. The regiment was an organic element of the newly activated 17th Airborne Division. Men of the 517th were charged with training and selection of airborne troopers, while at Toccoa. The regiment was later relieved from the 17th's command and moved to Camp Mackall, North Carolina. There, the 460th Parachute Field Artillery Battalion and the 596th Airborne Engineer Company were attached, creating the 517th Parachute Regimental Combat Team. In May, 1944 the team would be sent to Italy, where it saw it's first combat in the Grosetto region. From there, in early July, the unit was dispersed to 4 airfields in Frascati to prepare for Operation: Dragoon, the invasion of Southern France. On August 15, 1944, the 517th was the spearhead of the invasion along with the 551st P.I.B., 509th P.I.B., 550th A.I.B., British 2nd Independant Parachute Brigade as well as other attached elements. These units were the airborne element of the 7th Army, under General Alexander Patch. The official designation would be; First Airborne Task Force, under the command of General Robert T. Frederick, of First Special Service Force fame. The 517th PRCT was the largest element in the 1st ABTF, being comprised of the 517th PIR, 460th PFAB, 596th AEC, Anti-tank Company of the 442nd RCT and Co. D, 83rd Chemical Mortar Bn. After the swift completion of all initial objectives, the team drove north, into the Maritime Alps, cutting off and destroying retreating German units along the Franco-Italian border. This became known as the "Champagne Campaign". The 517th was then thrown into the Battle of the Bulge and eventually, into the Huertgen forest, striking into Germany at Bergstein. In March of 1945, the RCT was disbanded and the 517 P.I.R. was attached to the 13th Airborne Division in France, as part of 1st Allied Airborne Army reserves. After VE day, the 13th AB was ordered to the Pacific to begin preperation for the assault on Japan. Enroute to the U.S., the atomic bombs were dropped and Japan surrendered, negating the need for the invasion. The 13th AB Division was sent to Ft. Bragg, North Carolina, where it served until February of 1946. At that time, the 13th Airborne Division was disbanded. The 517th, would be no more. 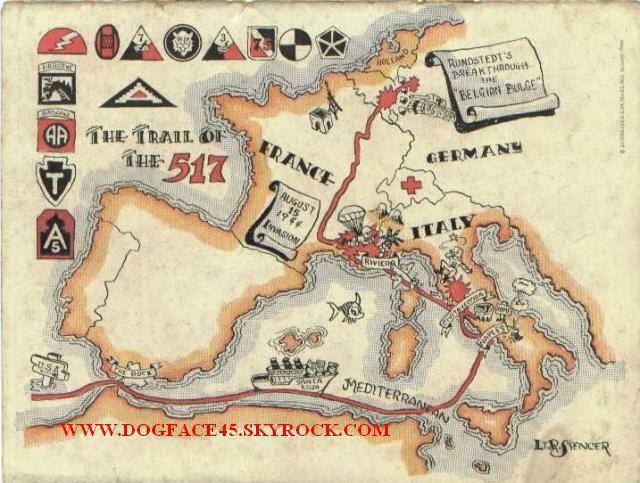 The 517th PRCT was awarded campaign stars for; Rome-Arno, Southern France, Ardennes-Alsace, Rhineland and Central Europe. The invasion arrowhead was awarded for Southern France.